Pretty much everyone will experience lower back pain at one time or another. 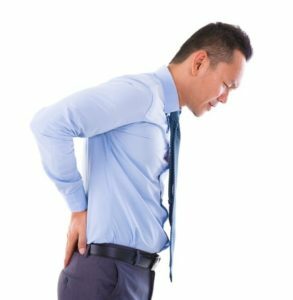 Pain in the lower back is one of the most common problems we see in our Denver chiropractic office, and it is a leading cause for missed work. The potential causes are numerous, which sometimes makes the discomfort difficult to diagnose and treat, but here at Denver South Chiropractic, we will work with you to determine the root of your lower back pain and find an effective solution. Here are just a few of the potential causes of your lower back pain. The lower back is subjected to nearly constant mechanical stress and strain because the weight of the upper body is always creating a load on the lower body. The spine supports all the weight of the upper body with a series of small bones stacked on top of each other. Between those discs are spongy pieces of cartilage call discs. The discs act as shock absorbers for the spine, and they prevent the vertebrae from grinding against each other. When these discs become herniated or degenerated, they can cause pain in the lower back. Unfortunately, a condition known as degenerative disc disease tends to occur when we age. This disease occurs as the discs gradually shrink and wear away. The discs may also tear or be otherwise injured. When discs become weakened due to injury or age, pressure on the disc‘s jelly-like center can occur. Eventually, the pressure can cause a herniated disc, also known as a slipped, ruptured or bulging disc. In some patients, the herniated disc places pressure on sensitive nerves that carry signals to the brain. This often results in excruciating pain that is felt in the lower back. A herniated disc could also put pressure on the Sciatic nerve and cause pain that extends from the lower back, into the buttocks and down the leg in a condition known as Sciatica. As we age, normal use and wear and tear make it difficult for our ligaments and joints to keep our spines in the proper position. Excess vertebrae movement can cause the bones to move forward and on top of each other. When the bones of the spine shift in this manner, they can press on the nerves in the spine, potentially causing lower back pain. Osteoporosis is a common condition among the aging, especially in women. It causes brittle bones and leads to an increased risk of painful fractures of the vertebrae. Bone spurs may also occur as the result of osteoporosis and potentially lead to a condition known as spinal stenosis in which the space around the spinal cord becomes narrow and puts pressure on the nerves. Overuse and repetitive injuries are some of the most common causes of acute back pain. In most cases, back pain caused by overuse clears up on its own within a few weeks but may recur as the result of a repeated injury. Lifestyle changes may be necessary to prevent pain and avoid serious damage to the back. Whether you are coping with chronic back pain or you‘re experiencing an acute episode, at Denver South Chiropractic, we can help. Combining cutting-edge medical technology with proven chiropractic techniques, we will work with you to determine the exact source of your discomfort and provide spinal correction treatment that will allow you to live like you did before you pain began. To learn more about Denver back pain treatment at Denver South Chiropractic or to schedule your spinal exam, please call 303-757-7272.